Gardening with kids is a great way to nurture budding gardeners. Many avid gardeners recall that their love of gardening took root in their parents’ or grandparents’ gardens. You can do the same for your kids: creating great memories that will inspire them to create their own gardens as adults. Too often we adults get caught up with results (getting planting, weeding and mowing done), but for kids, especially young ones, the priority is having fun. Engage kids by interest and temperament: some love flowers, others prefer worms, toads, bugs and butterflies, growing veggies, or helping you water or edge a bed. Age is important: very small children aren’t ready to handle seeds or transplants, so show them bugs, worms, plant roots, sprouted seeds, how drainage works. Give little kids pint-sized tools; tools made for women work for bigger kids. Kids grade-school age enjoy having their own patch for growing annual flowers and veggies; let them choose plants, but help them choose easy and fast-growing ones. Loosen up: you can live with a few crooked rows, the odd weed and strange color combinations. Show kids that insects are part of gardens. Teach them to respect bees and not be afraid of them. Bees and other flying insects pollinate flowers; even pests are interesting to learn from. Encourage older kids to enter vegetables or flowers into local fairs; garden projects are perfect for biology class or a science fair. Resist making gardening work: when it’s time to weed, keep sessions short and try to make a game of it; don’t insist on chores when it’s hot and uncomfortable. Plants with texture are fun. Kids like to touch soft plants like lambs’ ears, woolly thyme or colorful celosia plumes, purple coneflowers and straw flowers are neat for the opposite reason – they’re prickly. Kids love extremes: From tiny vegetables like grape or cherry tomatoes and dwarf sunflowers like ‘Teddy Bear’ to huge plants, like giant Russian sunflowers, or giant pumpkins (if you have space – one pumpkin plant needs an area at least six feet square). Vegetables: Interesting shapes and unusual colors have kid appeal; look for purple carrots and beans, rainbow chard, odd-shaped heirloom tomatoes, or yellow scallop squash. Flowers: Bleeding heart and snapdragon flowers are great fun to manipulate or take apart; annuals like cosmos, salvia and zinnia are brightly colored cutting favorites that produce more flowers if the kids pick them often. 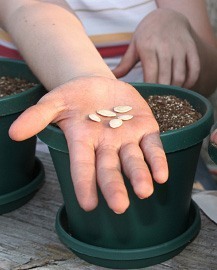 Seeds: Go for big, quick-to-sprout seeds like pumpkin, beans, peas, sunflowers and nasturtiums.